KINGS OF CHAOS, the part-time all-star rock ‘n’ roll collective that includes former and current members of GUNS N’ ROSES, STONE TEMPLE PILOTS and LINKIN PARK, has a announced a string of East Coast tour dates kicking off December 17 in Montclair, New Jersey. Following a mini-residency at the House Of Blues in Las Vegas December 1-3, the East Coast run will feature former GUNS N’ ROSES and VELVET REVOLVER drummer Matt Sorum, LINKIN PARK vocalist Chester Bennington, Robin Zander of CHEAP TRICK, Billy Gibbons of ZZ TOP, Steve Stevens, guitarist for BILLY IDOL, and Robert DeLeo, bassist of STONE TEMPLE PILOTS. 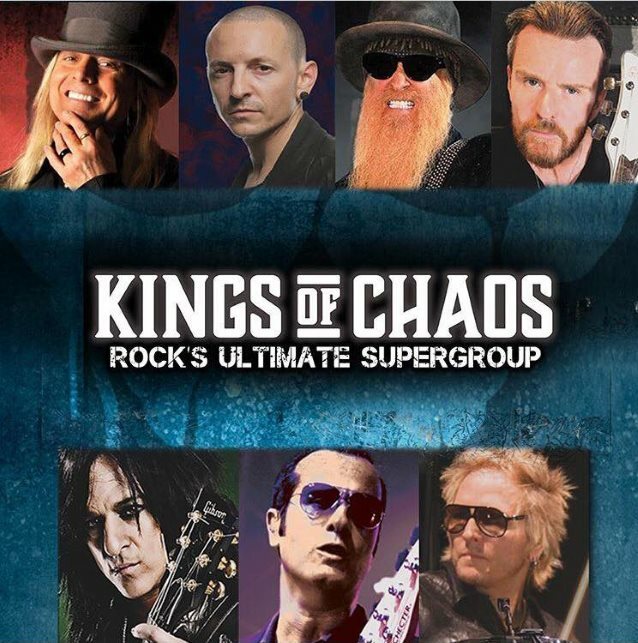 KINGS OF CHAOS‘s lineup for the Vegas shows will consist of Sorum alongside Robert DeLeo, vocalist Corey Taylor (SLIPKNOT, STONE SOUR), Bennington, guitarist Billy Duffy (THE CULT) and Steve Stevens. Regarding the future of KINGS OF CHAOS, Sorum told Robin Leach: “We’ll see where KINGS OF CHAOS takes us. It could turn into a band, it could be an album, we don’t know yet. I’m thinking about making some original music with it. Seeing if a singer will want to come in and be a permanent member. “Right now I just want to have fun. I just want to keep it loose, very spontaneous, go out and play for people and have them enjoy the music. I haven’t thought too far down the road yet, except maybe to record original music. 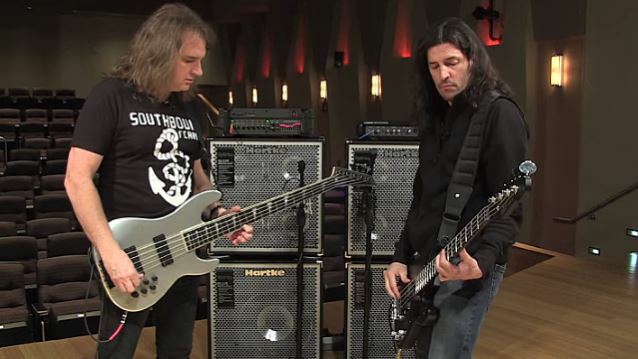 ALTITUDES & ATTITUDE, the project featuring ANTHRAX bassist Frank Bello and MEGADETH bassist David Ellefson, is in the studio in Hollywood, California recording material for the follow-up to its 2014 self-titled EP. Helming the sessions once again is producer Jay Ruston (ANTHRAX, STEEL PANTHER, STONE SOUR), with Jeff Friedl (A PERFECT CIRCLE, ASHES DIVIDE) returning behind the kit. “What started out as simple bass ideas quickly developed into some really great songs together,” said Ellefson. 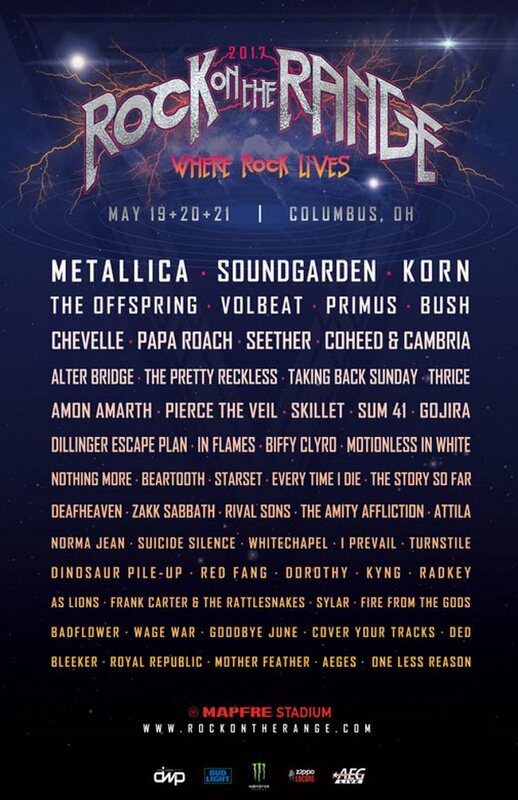 An unprecedented lineup has been announced for the 11th annual Rock On The Range, May 19, 20 and 21 at MAPFRE Stadium in Columbus, Ohio. Rock legends METALLICA, SOUNDGARDEN and KORN will each headline one night of America’s largest and most-acclaimed rock festival. Overall, Rock On The Range 2017 — fueled by Monster Energy — will feature over 50 bands performing on three stages, plus rock’s favorite comedians in the ROTR Rolling Rock Comedy Tent, The Music Experience, art installations, and unique onsite activities during the three-day weekend. Rock On The Range 2017 presale and layaway tickets, as well as limited numbers of new Weekend Field VIP tickets and Premier (hotel and camping) Packages, are on sale now at RockOnTheRange.com. The general onsale is Friday, December 2 at 10:00 a.m. EST. Beginning at that time, tickets will be available at RockOnTheRange.com, at Ticketmaster locations and the MAPFRE Stadium Box Office. Rock On The Range celebrated its tenth year in 2016 — and after a decade of setting the standard for American rock festivals, the crown jewel of the World’s Loudest Month showed no signs of slowing down, with “Rangers” from around the globe descending on MAPFRE Stadium. In 2016, the festival received awards of recognition from both Columbus mayor Andrew J. Ginther and the City Council, as well as a resolution from the Franklin County Board of Commissioners acknowledging the over $140 million in economic impact the festival has contributed to the city over its ten-year existence. Rock On The Range is produced by Danny Wimmer Presents, AEG Live and MAPFRE Stadium. Rock On The Range is supported by our rockin’ sponsors: Monster Energy, Bud Light, and Zippo. These partners, along with many others, will feature interactive experiences, artist meet-and-greets, and other unique fan engagement opportunities throughout the festival. 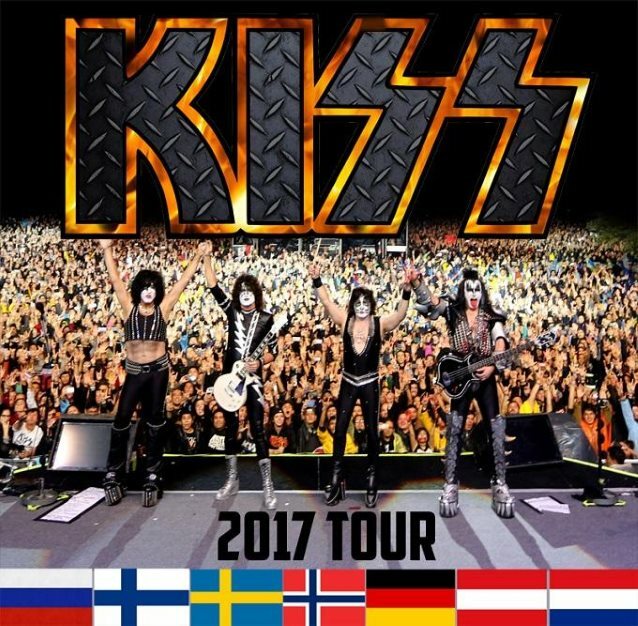 KISS has announced a series of arena shows across Europe in May 2017. Paul Stanley, Gene Simmons, Eric Singer and Tommy Thayer slayed the USA across July, August and September 2016 with a successful arena tour. They heard the calls from their European fans and they return for the first time since 2015’s series of festival and arena shows across Europe. KISS has earned more gold album record awards than any American band in the history of the Recording Industry Association of America‘s (RIAA) gold and platinum awards certifications. In the last 42 years, KISS has earned 30 gold albums (26 KISS albums and 4 solo albums that were all released simultaneously — a feat never before achieved by any band). KISS has 14 platinum albums, with three albums being multi-platinum. KISS remains one of the most influential bands in the history of rock and roll. Decades of record-breaking tours around the globe have included high-profile appearances at Super Bowl XXXIII, the Winter Olympics in Salt Lake City, the Rockin’ The Corps concert dedicated to our troops in Iraq and Afghanistan, special guest appearance on the 2009 “American Idol” finale that boasted 30 million viewers and a 2010 Dr. Pepper Super Bowl commercial and advertising campaign in support of their Hottest Show On Earth tour. Gene Simmons and Paul Stanley, with longtime members, guitarist Tommy Thayer and drummer Eric Singer, are stronger than ever with a legacy that continues to grow, generation after generation. Their last album, “Monster”, proved that they are still at the top of their game with impressive sales and topping the charts worldwide debuting at No. 3 in the U.S. on The Billboard 200 album chart and Top 10 in twenty other countries. The unparalleled devotion and loyalty of the KISS Army to the “Hottest Band in the World” is a striking testament to the band’s unbreakable bond with its fans. METALLICA‘s latest studio album, “Hardwired… To Self-Destruct”, debuted at No. 1 on The Billboard 200 chart, having shifted 291,000 equivalent album units in the week ending November 24. This marks the sixth time METALLICA has topped The Billboard 200, having previously landed at No. 1 with “Death Magnetic” (2008), “St. Anger” (2003), “Reload” (1997), “Load” (1996) and “Metallica” (1991). 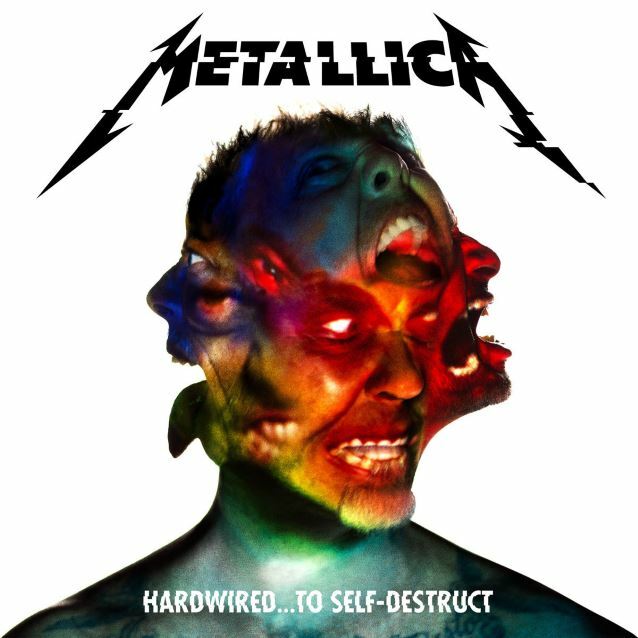 In terms of pure album sales, “Hardwired… To Self-Destruct” opened with 282,000 copies. “Hardwired… To Self-Destruct” is METALLICA‘s first studio album since “Death Magnetic”, which sold close to a half million copies in just a three-day sales window and topped The Billboard 200 chart back in September 2008. The band’s first studio album since 2003 moved 490,000 copies in its abbreviated frame, scheduled off-cycle on a Friday to accommodate a worldwide release date. METALLICA‘s previous CD, “St. Anger”, also had an unusual release date after Elektra Records decided to move up its release to Thursday, June 5, 2003 from Tuesday, June 10, 2003 “to ensure that counterfeit copies of the band’s first studio album in six years do not proliferate in the marketplace,” the label said at the time. “St. Anger” sold 418,000 copies in its first, shortened week on the streets to land at No. 1 on The Billboard 200 chart. METALLICA‘s “Re-Load” album sold 435,000 units during its first week in 1997, while 1996’s “Load” opened at 680,000. 1991’s self-titled “black album” debuted with 598,000 and has since gone on to sell more than 16 million copies in the U.S., according to Nielsen SoundScan. “Hardwired… To Self-Destruct” arrived on November 18. It consists of two discs, containing a dozen songs and nearly 80 minutes of music. METALLICA revealed last weekend that “Hardwired” was No. 1 in 57 countries, with the album going Top 3 in 75 nations and Top 5 in 105 countries. According to METALLICA‘s official web site, the band’s new album, “Hardwired… To Self-Destruct”, is currently No. 1 in a staggering 57 countries, Top 3 in 75 countries and Top 5 in 105 countries. METALLICA says: “Wow… what an insane awesome ride it’s been. We are stunned, beyond grateful and truly appreciative that not only have METALLICA fans embraced ‘Hardwired… To Self-Destruct’ beyond our wildest expectations, but more importantly, we’re proud to see that hard rock and metal is still viable and matters in 2016… TO SO MANY PEOPLE! The support, excitement, and love from all corners of the planet means so much to us and we are sincerely blown away by the response. According to music industry web site Hits Daily Double, “Hardwired… To Self-Destruct” is likely to sell between 250,000 and 270,000 copies in the United States in its first week of release. The SPS figure is expected to be between 260,000 and 280,000. SPS, a practice used by Billboard magazine, stands for “sales plus streaming,” which includes album sales and converted track sales plus converted streaming data. METALLICA‘s “Death Magnetic” album sold close to a half million copies in just a three-day sales window and topped The Billboard 200 chart back in September 2008. “St. Anger” sold 418,000 copies in its first, shortened week on the streets to land at No. 2 on The Billboard 200 chart. 2016 has been a banner year for thrash masters ANTHRAX: the February release of the band’s critically acclaimed eleventh studio album, “For All Kings” (Megaforce), two collaborations with director Jack Bennett for the grizzly music videos “Blood Eagle Wings” and “Monster At The End”, a “Late Night With Seth Meyers” appearance that paired the band with the iconic Robert De Niro, and sharing stages with bands like SLAYER, IRON MAIDEN, SLIPKNOT, LAMB OF GOD and AVENGED SEVENFOLD. But the celebrations are not done yet. 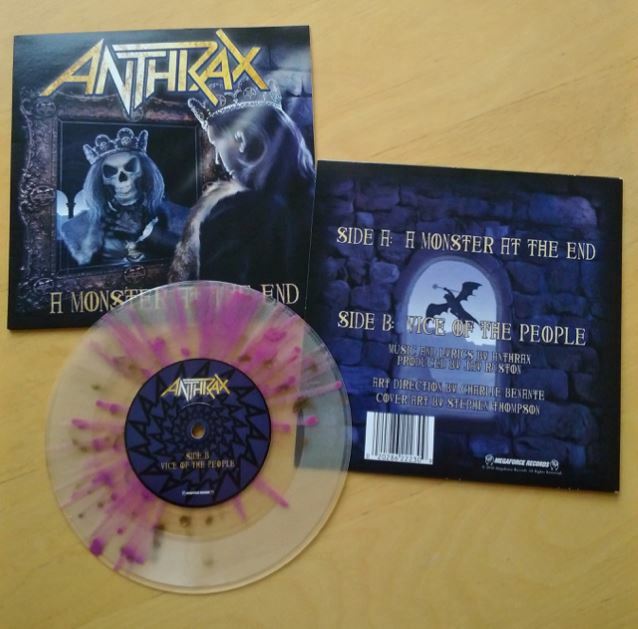 In support of Black Friday’s Record Store Day (November 25), ANTHRAX will release a limited-edition seven-inch single pressed onto lilac and gold spatter vinyl (Megaforce) for the tracks “Monster At The End” and “Vice Of The People”, the latter previously released only in Japan as a bonus track and being made available in North America for the first time. In addition, an acoustic version of the band’s song “Breathing Lightning”, also on the “For All Kings” track listing, has just gone to radio. The song was performed and recorded at a special in-studio session at El Paso’s rock radio station KLAQ-FM on October 27, the final date of ANTHRAX‘s recent North American tour with fellow “Big Four” members SLAYER. ANTHRAX will head to New York next month to co-headline (with MEGADETH) the 2016 Epiphone Revolver Music Awards on Tuesday, December 13. “For All Kings” sold 34,000 copies in the United States in its first week of release to land at position No. 9 on The Billboard 200 chart.